Arriving in Battambang our bus was met by the Tuk Tuk mafia, all vying for our custom. Me, Amanda and Dylan settled on one, paying just $1 to be taken to our hostel and arranging to be taken around the next day for $6 each. The rest of the day was just spent chilling at the hostel and eating in restaurants. The hostel was newly opened, it’s called BTB Cambodia and it was great, very cheap and good dorms. 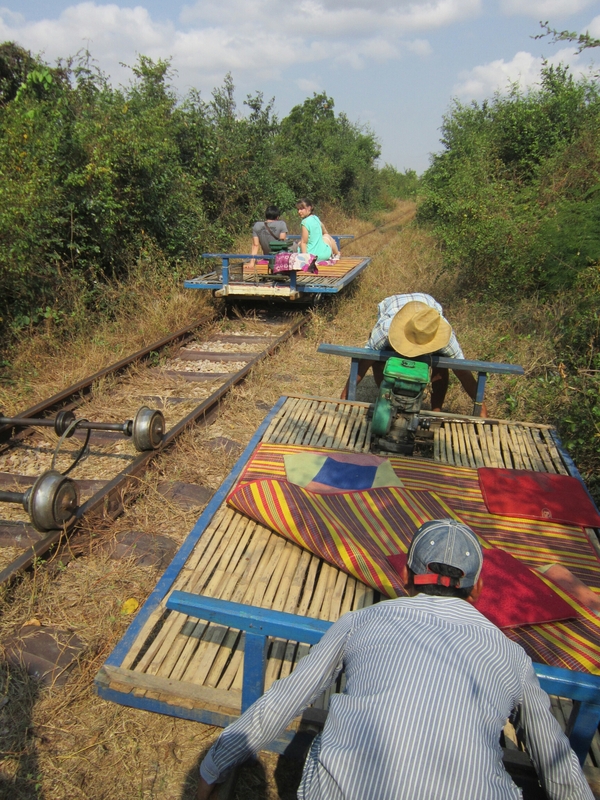 So day 2, embarking on our Tuk Tuk tour our first stop was the Bamboo train. It’s a bit of a bizarre experience! We met a guy from Halifax named James who shared our ride, which was cool as we met back up with later on our travels too! First off their is no railway system in Cambodia at current, the bamboo train appears to be the only thing making use of the lines, though of course they may reuse them for ‘actual’ trains (i.e. what we think of as a train) in the future. So we were put on the singular line and a driver took the 4 of us a long. When you meet someone (or even more) coming the otherway the ‘trains’ stop and one is disassembled and taken off the line so that the other(s) can pass. It’s maybe 20 mins or so to go from one end of the line to other, potentially longer depending on how many other trains are on the line. The other end is just a few shops with people trying to sell you things (including kids of course so we just asked them when they had school) which is kind of annoying, it’s all about the ride rather than the destination! Next up our driver took us this bridge, he said was Battambang’s Golden Gate bridge! It was a kind of wooden rope hybrid bridge that only pedestrians and bikes/scooters can cross. Across was a cool temple, with loads of awesome statues relating to Buddhism. I didn’t get the name unfortunately. He then took us to show a local farm by the river, pointing out what they were growing, such as Pumpkins, Morning Glory, Zucchini, Lettuce and other vegetables. There was a Muslim village across the river as well which had a Mosque. All interesting to see, a (small) insight into local life. We then were taken to a place with hundreds of fruit bats living in a few tree’s, cool to see them all hanging there which they slept! After a break for a couple hours we then went to Phnom Sampeau to see a few things. First was the Killing Cave, a place where the Khmer Rouge murdered people during their terrible reign. There a small shrine there containing skulls and bones of the victims. There is a shrine at the top of the mountain with plenty of monkeys hanging around and a cool view over the surrounding area. Last up the most impressive sight of the day. 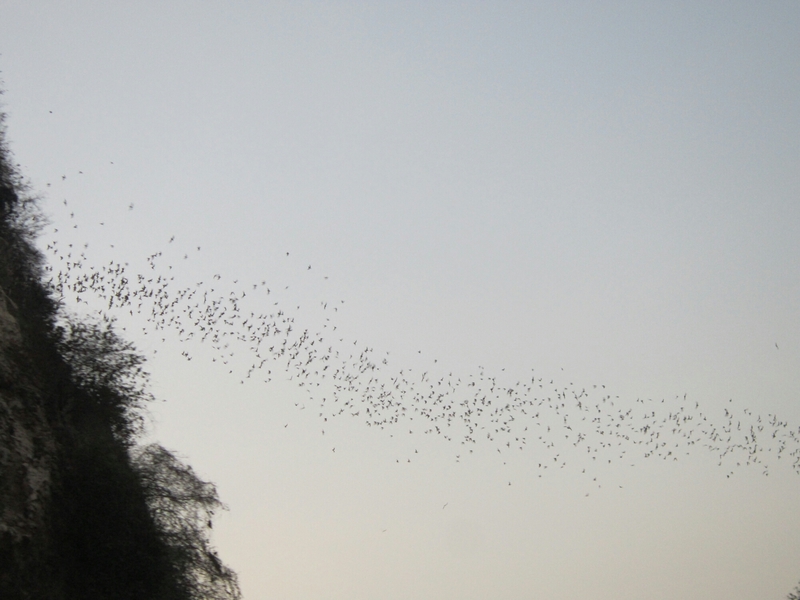 At dusk over a million bats stream out of a cave in the side of the mountain to search for food. I have no idea of the precise numbers….it’s a lot! It really is spectacular to see them all flying out, a long line of them emerging into the outside world, twisting and turning as it heads into the distance!